As my husband and I prepare to welcome our first child, we keep looking for ways to trim expenses. As first-time parents, we of course want the best things for our child, especially since a lot of these baby items will be reused for future children. And we also need to get items to keep your baby safe. Between nursery furniture, clothing, day to day toiletries like diapers, and not to mention daycare and starting a college fund, the expenses add up quick! We decided to take on a minimalist approach to parenting and simply get the necessities. Even by planning on reusing items for future children, there are still a lot of upfront costs to get set up for a baby. We figured if we did our research, we could save lots of money buying used items. 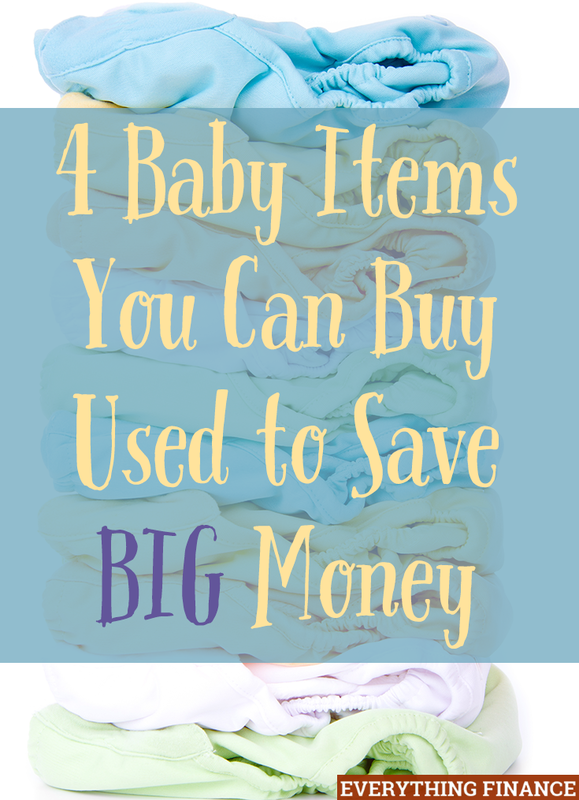 Here are 4 used baby items we’re buying to save money. The crib is one of the biggest expenses you’ll incur when it comes to setting up for a baby. While some people may be fearful of buying a used crib due to recalls, you can easily type the crib name and “recall” into Google to see if the crib has actually been recalled. We looked at lots of cribs and the ones we wanted started at a minimum of about $500. By searching through local mom to mom sell groups on Facebook, we were able to score a Pottery Barn, made-of-real-wood baby crib, for $200 (with an original price tag of $899!). Diapers are a consistent monthly expense and can cost families up to $600 per year. If you diaper your child for at least 2.5 years, you’re looking at $1,500 for just one child! Cloth diapering is the new trend being touted as an environmentally-friendly alternative to conventional diapers. However, as a working mom, I needed cloth diapers to be as easy as possible. For this reason, I’m sticking with the more expensive, but time-efficient, all-in-one diapers, which can run about $25 a pop. Considering kids go through about 8-12 diapers a day, that’s a lot of dough up front if you don’t want to be washing every day! I did my research and found that many women buy used cloth diapers. While the thought can be unsettling at first, a simple bleach soak and strip will rid the diapers of all bacteria and make them practically new. I’m building up my stash now and plan to spend no more than $350. That’s a $250 savings in the first year alone, and it will really pay off when I reuse the diapers for future children! Nursing moms hail the necessity of a glider to get through those late-night feeding sessions. However, a quality glider can easily cost hundreds of dollars and put a severe dent in your budget. We bought our Pottery Barn glider used for $50 from a family I used to babysit for. All it needed was a thorough cleaning for an additional $50. Strollers get used a ton and you may want to invest in your own quality double stroller. But consider buying a used single stroller for your first child. You can always upgrade to a quality double stroller when you have your second child, or when your finances aren’t as stretched as when you’re trying to set up for your first baby. Getting ready for your first baby is expensive, and it can be very tempting to go crazy buying the best brand of everything. But the truth is, a lot of parents overspend for the sake of spending, and many parents have buyers remorse when they realize their child can’t use nearly as many items as they thought. Be prudent with your expenses, and you can save a ton of money. How did you save money on your first child? Are you a fan of buying used items? Where did you get them?